I’ve been bullish on Facebook’s new Live Broadcast Platform for the last couple of months. I’ve encouraged you to get involved, either by broadcasting live tours of your office, Q&A type of events and even live surgeries. We’re barely scratching the surface on the power and reach of this new live platform. But through our early tests, the live surgery angle has had the most virality. And my favorite metric – surgeries. They’ve booked half a dozen patients out of this too. All on just a few hundred dollars worth of boosts. I would kill to have this kind of ROI across all our media activity. The Facebook live ‘wave’ continues to build, and it’s time to jump on. Maybe you totally get it, but you still aren’t sure about broadcasting a live surgery. Totally reasonable concern. I get it. Which is why I’m writing to you today with a variant of the live broadcast that carries less risk and also will produce a superior end product. First of all, you can record the entire ‘Live Video’ without anyone seeing it. When you get to the ‘Live Video’ screen (click the ‘Status’ button in Facebook, and ‘Live Video’ will be one of the options) click the ‘Share with’ dropdown. It’s probably set to ‘Public’ right now. But you can change it to ‘Only me’ which means no one else can see it. Then you record the video, make sure you like it. If you’re good with it, switch the ‘share with’ status to ‘public,’ and you have the live video recording. Now for the actual content of the live video, I want to share with you a new way to work around the unpleasant sounds, the somewhat graphic nature, the sometimes-boring aspects of showing a surgery live in the surgery suite. Rather than shooting a live video in the LASIK suite (like you see in the Parkhurst example), I’m giving you a new framework to use. 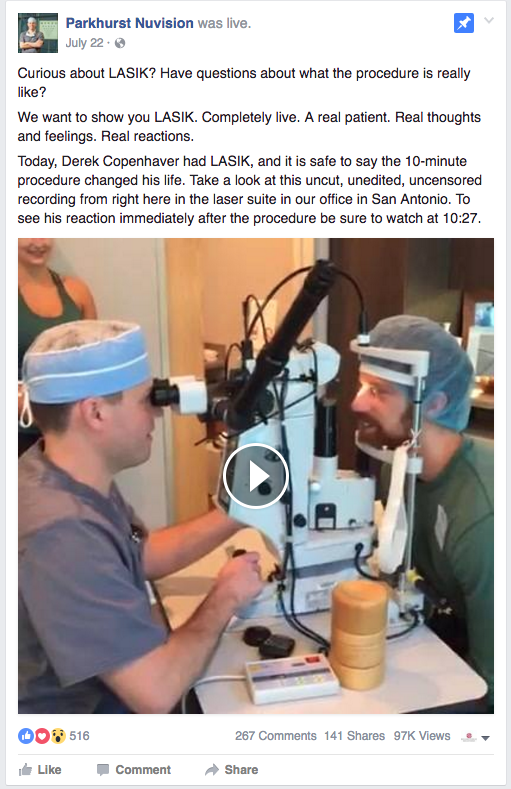 Imagine with me for a second that a walk-in comes through your doors on LASIK day, and he wants to talk to someone about LASIK and watch a surgery. What would you do? You would have your counselor meet John Doe and invite him to watch a LASIK procedure in your surgical suite (this works best if you have the gallery-style surgery center). Counselor would then explain the procedure as it happened, addressing common misconceptions and expanding on key, important aspects of the surgery in real-time. Pretend Facebook Live is a walk-in patient. 1. Have one of your counselors host the Facebook Live session, during a surgery for which your patient agrees to be filmed. 2. Counselor starts the broadcast in ‘selfie mode’ (camera turned toward her own face) to introduce herself and the practice and explain that we’re about to watch a LASIK surgery. 3. Counselor flips camera to John Doe Patient as he’s about to walk into the LASIK suite. Counselor asks John Doe Patient how he feels, what he’s thinking. Then John enters LASIK suite. 4. Counselor does NOT enter LASIK suite, but stays outside to watch through the window. 5. Counselor then explains the procedure in real-time as it is happening. 6. Video concludes with John Doe leaving the LASIK suite. Counselor asks how it was, John Doe gives a few soundbytes, and counselor flips back to selfie mode to conclude and give a Call To Action (message us or give us a call with your questions or to schedule your free consultation appointment). #5 is where the magic happens. This is a chance for counselor to talk about the procedure, misconceptions, what’s important when choosing a surgeon, and other FAQs in a very natural way. You get the picture. The counselor carries the narrative, while you’re also mitigating risk of broadcasting a live procedure. You’re showing the procedure from afar, with none of the semi-graphic visuals that you see when you’re ‘up close and personal’ in the surgery suite. But the viewer still feels like they ‘see’ the procedure and how quick and easy it is. So it’s a win-win. And if something goes awry, you (surgeon) can have a signal for the camera – a thumbs up or a wave. And that can be a signal not to address the patient when leaving the surgery suite and to go ahead and wrap up the video. If you don’t jump on Facebook live now, you’re missing a big opportunity, and you’re losing new patients who could be coming through your doors. If you weren’t comfortable with the standard Facebook Live surgery concept, I hope you try this variant. When you do, let us know so we can help you boost the video and get it in front of 10s of 1000s of potential patients in your area. Questions? Shoot me a message, I’m happy to help.